All of Cooke Street (behind The Sovereign Room) will be closed to traffic for the NINTH ANNUAL Y-Art Sale and the LOST &FOUND Street Art Festival. Find over 70 emerging artists selling their handmade treasures! Shop for original art, silk screened shirts/patches, photography, ceramics, embroidery, zines, jewellery, vintage clothing, books, records and much more! Find handmade, crafted and collected treasures by emerging artists ages 13-30ish. 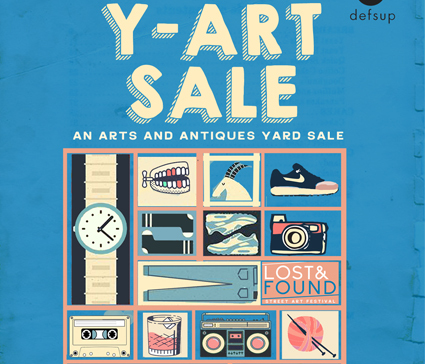 The Y-Art Sale is unlike any other yard sale or arts/crafts fairs you’ve been to. Come chill with us! Soak up live music & dance, food vendors, free art workshops, and the completion of TBay’s first and only GRAFFITI ALLEY. All proceeds go to the artists! Support our artists of the future. Live Original Music by Nick Michieli, Paige Alexis Guzzell, and Jada Ferris!